Whether you have one course or what seems like 12 million, you need to sort and keep track of them. 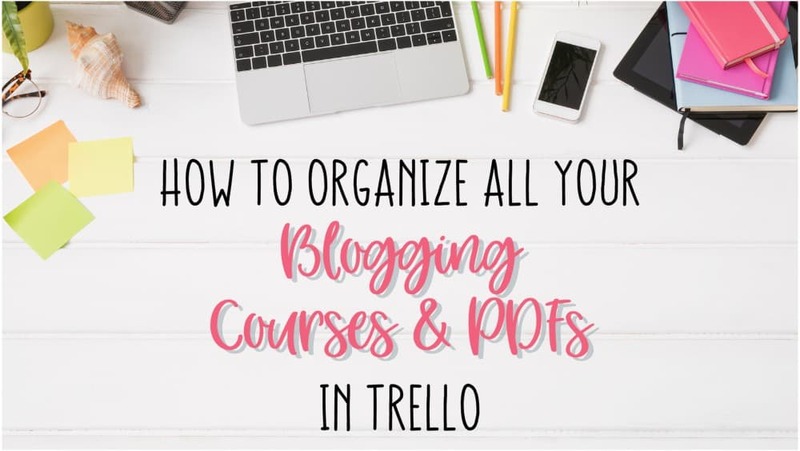 I’d love to show you how to organize all your blogging courses and PDFs in Trello! If you’re a course junkie like me, you’re going to need a way to organize and sort ALL your courses. We can’t just let the confirmation email sit in our inbox. This method has benefited me so much! Especially when I see a course that I want to buy, going into my courses Trello board and knowing that I ALREADY have access to a course that will teach me what I need in a specific area of blogging. Because let’s face it, there is SO MUCH to learn. This post is a part of my FREE email course! Want to watch the video and get more organization tips? Join the FREE 5-Day Blog Organization Trello Boot Camp to get access to the video! Let me help you save your time AND potentially save you some money by organizing ALL your courses and PDFs. Wouldn’t it be nice to have everything in one place, at your fingertips, ready for when you are ready to learn? Now depending on HOW MANY courses you have, this may take you a while. But just like the tip I gave you on Day 1, set aside intentional time to get this done. It may take a little time, but it is worth it! Manual Pinning Organization in Trello will help you organize ALL your pins. You’ll know when and where you pinned them last and I’ll show you how to pin to the BEST boards. I’m going to show you how to organize all your resources PLUS give you the inside scoop on the best resources available to bloggers. Click the link above or the picture below to be notified when it’s available! Can I ever say enough good things about Dare to Conquer? I don’t even know what to call it. It’s not a course. It’s like a mastermind hub of all the courses you’ll need on your blogging journey. SEO, Affiliate Marketing, Email, Sales Funnels + tons more. And then there’s the community…and access to the course creator himself to be able to pick his brain. Plus more. It’s incredible. And one of the best investments I’ve made in my blogging career. This is one of my favorite courses ever. There is stuff you just can’t learn in any other traditional course. And this and the course I mention below this is one of them. Pinteresting Strategies (Use code pinning5 to save $5) got me into MediaVine. Her method is incredible. PLUS it pairs perfectly with my course – Manual Pinning Organization in Trello. This is another non-traditional course. The way PotPieGirl explains SEO and her process blows my mind. And it works. This course is gold. If you’re looking for an easy way to implement SEO then you NEED this course. If you aren’t in DTC since you’ll have access to an Affiliate Marketing Course, then I highly recommend Making Sense of Affiliate Marketing. The way she explains it is simple and easy to implement. Her course is known in the blogging community for the end all be all for Affiliate Marketing. Are you ready to organize ALL your courses and PDF’s? Sign up below to start the FREE course! And here I thought I had an issue with classes. Girl, you got me somewhat beat! LOL. I adore this series. I recently had all my courses and PDFs in Evernote, but we’re no longer on speaking terms. I then moved it all to Airtable (which I love), but Trello is much easier to use and it doesn’t look cluttered. I just wanted to let you know I’m really enjoying this and I can’t wait for tomorrows video. I broke up with Evernote too! So glad you’re enjoying the course Stacey!